Mohammed Salah and Lionel Messi are probably the biggest names in the world of football and recently got fans in a tizzy with their skills. Mohammed Salah and Lionel Messi are probably the biggest names in the world of football and recently got fans in a tizzy with their skills. Fans were divided over who is better. It all comes down to the one Pepsi can both have been fighting for. Yes, all that was for the latest Pepsi ad. It was the Liverpool star who took to his social media account to give the world a glimpse of it. What got the fans excited was the caption, which was, ” #FORTHELOVEOFIT”, the ad has gained the attention of fans overnight. In the video, you can see the two stars in an isolated petrol pump flaunting off their skills to win the last can of Pepsi. 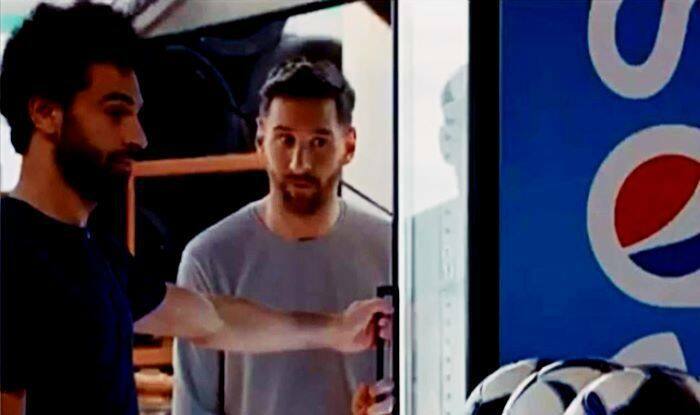 Messi gives the green signal for a challenge and both agree to it, it was all for that one last can of Pepsi. As the superstars get engaged in the serious footy fight, the kick garage attendant takes the Pepsi tin and enjoys the show. In the end, both Salah and Messi can be seen running towards a passing Pepsi truck.